Once again, Syracuse needed to dig out of a big hole and, once again, the Orange were not up to task, falling short in their third straight comeback attempt, dropping a 71-65 contest at Georgia Tech. SU pretty much played dead for 15 minutes of game time to turn a nine-point first half lead into multiple 13-point deficits and were unable to come all the way back during the final five minutes of the game. The loss drops Syracuse to 16-12 overall and 8-7 in ACC action while the win boosts the Yellow Jackets to 16-11 and 7-7 in conference play. The Orange will now have to win their final three games, including upsets of Duke and Louisville, to be considered a lock for the NCAA Tournament prior to the conference tourney getting underway. For the second straight outing, the SU offense was stale, this time shooting 35.7 percent for the game and 31.6 percent after halftime. The weak shooting more than offset a 41-36 rebounding advantage, including 19 offensive boards. Both teams struggled to score early and Georgia Tech was the first to post back-to-back scores to get an 11-9 lead after the midpoint of the opening half. 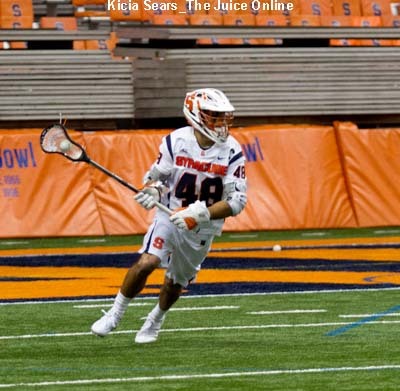 Syracuse responded by scoring eight of the next 11 points in the action. Andrew White III got free from the defense and connected on an 18-footer to knot the score, then Tyler Lydon made a long entry pass to Taurean Thompson at the rim for a lay-in and a 13-11 Orange lead. Tyus Battle drained an 18-footer of his own, then Thompson crossed the lane for a jump hook and a 17-14 SU lead with just over six minutes on the clock. After a Yellow Jacket three knotted the game, White III got hot, rattling home a three from the left wing. After four GT points gave them a one-point lead, Frank Howard found White III for two threes to trigger ten straight Syracuse points. First Howard drove and fired a crosscourt pass to White III on the left wing for a triple, then set him up for another just off the top of the key early in the shot clock. Thompson then swished a jumper just inside the arc on the left side and Howard drove for a lay-up and foul. Howard’s free throw missed, but the bucket boosted the Orange to a 30-21 lead with two minutes left in the half. Shortly after, the Orange went into a drought of more then six-and-a-half minutes and Tech took advantage, bookending halftime with a 12-0 run for a 35-32 lead. Battle broke the stretch with a three, but it barely slowed the Yellow Jackets. Just over a minute later, Georgia Tech took off on a 12-1 run to open up a 51-38 lead with just over nine minutes remaining. SU was unable to cut into the lead for six minutes, alternating markers with the hosts. Then, with just over three minutes on the clock, the Orange started to rally. White III drained a three and, when the Jackets threw away the ball, John Gillon came up with it and drew a foul. Gillon’s free throws brought Syracuse within 60-52. Twenty seconds later, Howard swished a three from the right corner to make it a seven-point game. Less than a minute later, Thompson was rejected, but cleaned up after himself to draw SU within a half dozen at 65-59 with 1:41 to play. After a GT basket, Thompson corralled an airball and scored while being fouled. Thompson could not connect from the line, but the rebound went out of bounds and back to Syracuse on official’s review. On the ensuing possession, the Orange got another loose ball offensive rebound and made it pay off when Battle found Gillon in the left corner for a trey that sliced the Yellow Jacket lead in half to 67-64. SU called time out to set their defense. The move worked, as Tech turned the ball over to Lydon while trying to avoid a five second call and the sophomore forward was fouled going up for a shot. 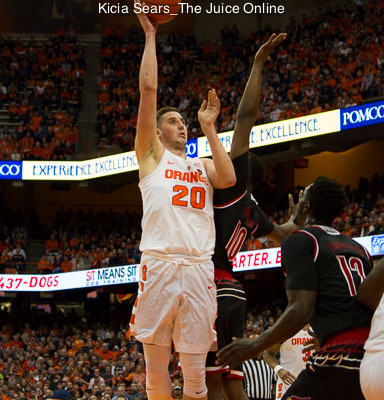 Lydon could only make one from the line, bringing Syracuse within two with 56 seconds on the clock. Georgia Tech could not score on their possession and the Orange rebounded. SU came down and Gillon tried to use a pick to drive, but Tyler Roberson was whistled for an illegal screen, giving the ball back to the Yellow Jackets and forcing Syracuse to foul. Tech nailed two foul shots for a 69-65 lead, then Gillon missed a three. The Orange fouled again and Tech got the first shot, then the rebound of the second, drawing another foul in the process. One more free throw went up on the board, closing the scoring. Taurean Thompson paced SU with 18 points while pulling down a dozen boards and blocking three shots. Andrew White III had his streak of 20-point games stopped, but drained four threes en route to 17 points. Tyus Battle chipped in with 11 points while Tyler Lydon scored seven points, all in the second half, and grabbed 15 rebounds. Ben Lammers was the top scorer in the game, rolling up 23 points for Georgia Tech and blocking seven shots. Tadric Jackson poured in 20 points while Josh Okogie added 13. 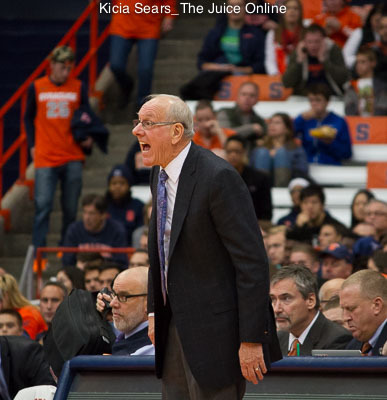 Wednesday night, the Orange will face off with #12 Duke at the Carrier Dome. The Blue Devils (22-5, 10-4) will come in hot, having won seven straight games, three of them against ranked foes. Four different players average in double figures for Duke, led by guard Luke Kennard, who averages 20.0 points per game by shooting 52.3 percent from the field, including 45.5 percent on threes. Jayson Tatum and Grayson Allen both average over 15 points per game. ESPN will televise the game, which will start at 7:00pm Eastern. The game will also be available online at espn3.com.